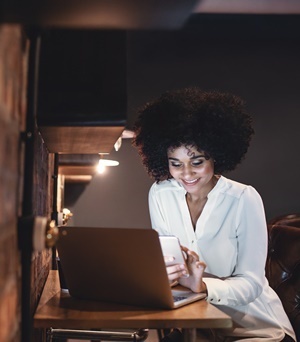 Cape Town - Ecommerce in South Africa is exploding and is estimated to have amounted to about R10bn during 2017, according to Geraldine Mitchley, Visa senior director for digital solutions in sub-Sahara Africa. There is a massive growth opportunity in the digital commerce sector, she said at the DHL eCommerce Money Africa conference in Cape Town. It is driven by high mobile penetration, rising consumer confidence in online transactions, and the expansion of brick and mortar retailers into the online sphere by adopting a multi-channel approach. At the same time consumers' shopping habits are changing too. Many do research online and then complete the transaction in-store, or the other way around. "Local internet retailers are modifying channels to be able to add more value for their consumer base. They are simplifying and improving accessibility and offering more benefits," she said. "Companies are eagerly implementing a variety of digital initiatives to transform the customer experience." At the same time online stores are exploring the added options physical stores can bring to their customers. An example is a Nike store in New York, which even has a basketball court, treadmill monitors and a soccer pitch. At the same time the brand leverages the ecommerce channel to sell directly to customers in-store. Data intelligence and machine learning are used in physical stores too. Clothing tags, for example, can keep track when customers are browsing. There is also technology like digital mirrors to check sizes and colours. The digital experience then transcends into the physical space. South Africans spend mostly in the fast food category of online shopping, while groceries are still purchased with greater frequency in-store than online. Research also shows that cross border online spending is increasingly common in SA. Since so many South Africans are using their mobile phones to shop online, Visa has realised that one must make it easy for them to shop online on a small mobile screen and having hold the phone in one hand. "The SA internet retail market is in its infancy by global standards, but even so, retail players are increasingly operating on omni channels," she explained. Competition is fierce and the more mobile friendly channels are accelerating. Smaller businesses can also use social media as "store fronts" for their brands. Ensuring secure payment and trustworthy, convenient interaction remain important for competing in the ecommerce sphere. Customers also remain concerned about non-delivery and fraud remains a risk as well as potential damage to goods. To address the risks associated with data breaches, Mitchley said Visa foresees increased use of tokens for payment. "We foresee that everything is converging to payment in the cloud. Tokens can protect payment data and act like a kind of surrogate of a credit card," she said. "Tokens will reduce fraud as the domain and user are restricted to a particular device, merchant, transaction type or channel."